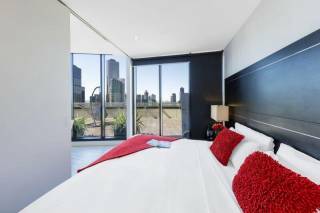 Embrace all that Melbourne has to offer by staying in a prime location on Flinders St sleeping up to 3 guests. Located on Level 10 you are greeted with premium views of the Yarra for you to enjoy on your own private balcony replete with cafe table and chairs and micro garden. Sit back and embrace the vibrant edge of Melbourne absorbing the waterfront views of the Yarra River, Crown Casino and Southbank promenade. Live the Cosmopolitan Riviera lifestyle by listening to live music, enjoying a vino or dining on some tapas in one of the many waterfront restaurants. A 5 min walk across the footbridge will provide easy access to the Yarra, Southbank and South Wharf Promenades. You are a short walk from many attractions such as the Melbourne Aquarium (next door) and only a 10min walk to Etihad Stadium, Southern Cross Station and the South Wharf DFO outlets. Add a boat experience to your Melbourne trip by jumping on one of the 5 star rated Yarra River cruises. A tram stop out the front and two major train stations nearby will make it a breeze when travelling around the CBD. Jump straight on the free City Circle Tram and hear all about the history of Melbourne. This newly styled 1 Bedroom, 1 Bathroom apartment is ideal for your Melbourne base whether you are travelling for business or pleasure. You have everything you need from the sun lit kitchen area with modern appliances including a Nespresso coffee machine. Listen to some tunes on the Bluetooth speaker, connect to the Free NBN Wi-Fi access or simply watch Fetch Tv. Staying longer? Take advantage of our long stay rates and live in all the home comforts. You have a well-stocked kitchen as well as a washing machine and dryer for you to take advantage of. Central Heating and Cooling is throughout the apartment so you can stay warm in winter and cool in summer. Smoking is not allowed inside the apartment however you may smoke on the balcony. A fully equipped kitchen with all the modern necessities including Electric stove top and oven, pots and pans, Dishes and utensils, dishwasher, Nespresso Coffee Machine, microwave, toaster and kettle. 4 Seater Dining table. Sony Flat Screen TV with Fetch TV, free Movies and DVD player, Bluetooth Speaker, Free NBN Wi-Fi. Washing machine, clothes dryer, iron and ironing board. Fully retractable contemporary screen encloses the bedroom when privacy is required but can also be left open plan to make the most of those great City views. A porta cot and high chair: no charge upon request. Please supply your own linen for bubs. Separate shower enclosure, single vanity, and toilet. Washing Machine and Clothes Dryer. Please advise if you would like to bring your dog. One Dog is welcome upon application and must fit the following criteria: 1 small dog only under 10kg, Toilet trained. This apartment is located on Level 10, so we recommend you use Batman Park behind the building for regular walks and bathroom breaks. A $50 pet fee applies. Albert Park Lake – Home of the Australian Grand Prix. 2.3Km, 30min walk or 10min drive. Staying 9+ nights? We include compulsory interim housekeeping. Additional cleans can be provided on request. Staying between 3 and 8 nights? Let our housekeeping team provide you with a fresh, clean apartment! Available at a rate of $90 AUD per service.